As you start to think about your fall wardrobe, you might be wondering what some of those key pieces are that you need to dig out of your closet, or what you should be on the look out for to purchase. One of those key pieces you can build many different fantastic outfits around is a patterned blouse. Wear it with a skirt, with slacks or a pair of jeans and blazer. Here are a few patterned blouses that caught my eye, as well as 2 outfit ideas below. 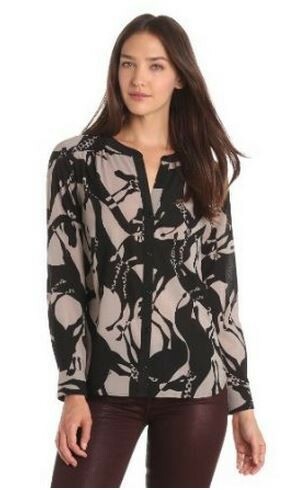 See more patterned blouses on Amazon here. More LOFT tops, including online exclusives, here. Patterned blouses look great with just about anything and they are perfect for layering during these crazy transition seasons. 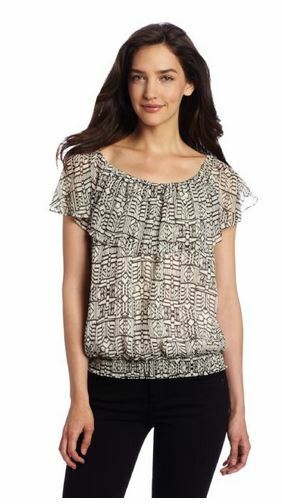 You can also easily take a patterned blouse from a day to evening look with just a few changes. Here are a couple of outfit ideas featuring the patterned blouse. Outfit 1: Add some pops of color with your accessories. Blue shoes? Oh my yes! Outfit #2: This season’s darker jeans are back, which I am a big fan of. They dress your jeans up a notch. And I love me a pair of jeans. 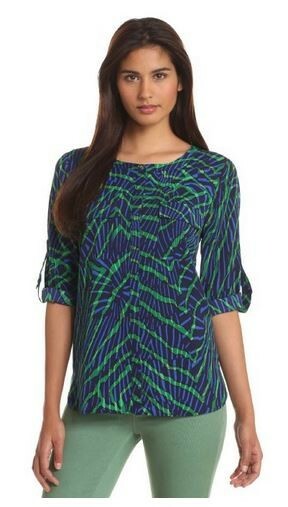 Browse through your closet and see what patterned tops you have. Lay them out on your bed and see what different outfits you can create. You just might surprise yourself!